Testimonials... Real People. Real Situations. "I like the AdvanTech product for its weather resistant properties. The high strength and minimal deflection. The product allows me to use thinner sheets for the same cost as thicker plywood products. I will never have to sand seams again or underlay plywood that delaminated. The grid system means no more chalk lines and no more excuses for missing rows of nails." "October 2001 to January 2002 I built a 6000 SF home. I had considered using OSB or plywood with a sealer becasue I know the Pennsylvania winter would factor into the construction. I used over 300 sheets of AdvanTech. I did not replace or repair one sheet and highly recommend AdvanTech to other builders." "I am very pleased with the AdvanTech. It is very strong because it has taken a month of rain and hasn't bucked yet. It is holding up really well. I recommend this product to any new or remodeled house because of it's strength. " "First, Advantech is the best product on the market. YEar round Advantech subfloor stands up to the elements and is as strong when the product is complete as when we first put it on. The fastening grid is a bonus. Now we can acccurately and quickly nail on center all of the time." "My most recent use of AdvanTech did not have a grid pattern. I highly recommend AdvanTech flooring for structural strength and its ability to resist water. Even after several days of rain there was not sign of warpage or separation. " "AdvanTech is one of the most trouble free products we use -The product is always square and flat/with plywood in the past we had sheets 1/8" out of square. My flooring people also are very happy with it. No high seams or delamination. The new grid is a great idea. Saves time on fastening." "AdvanTech is the best wood floor product on the market today. The marks for the joist and trusses are a big plus. This product will not except any water like plywood products. AdvanTech is number one in my book. " "AdvanTech 3/4" T&G flooring is the greatest. Neither plywood nor OSB can compare with the superior performance of AdvanTech. The new fastening grid however does present some difficulties in normal wall layout procedures such as not being able to see the measurement marks on black ink/"
"The job goes quicker when used. It helps speed the job so I can get more jobs completed in a shorter time period. I love the strength you get out of the product. This product withstands the weather outstandingly. The material can be dropped off the delivery trucks and you do no have to worry about weather affecting the material. It doesnt warp." "Framer like the grid because he did not have to chalk nail pattern. AdvanTech has also eliminated the problem with squeaking floors. Thanks. " "I have been building for 27 years and have wished about 80% of the time of 3/4" decking that someone would come up with a better quality plywood. AdvanTech did. And with the fastening grid you save so much time. The quality if great!!! Thanks. " "Fantastic! Really lines up tight. Easy to work with and I will definitely recommend it to others. Withstands water better than anything I have ever used. " "I really like the strength and durability of the AdvanTech. I built a 26 x 44 addition on my own house and the AdvanTech floor sheathing was exposed to the weather for quite some time (2 months) because I only had nights and weekends and it totally kept it's integrity. I like the grid also. It makes fastening so much easier. " "AdvanTech is a great product. We have never had to replace because of water damage. Customers like the security of not worrying aobut rain during the construction process. We will continue to use this awesome product!" "Much more stable in adverse weather than OSB. Fastening on grid much faster and goof proof for less experienced workers. No missed joists. " "After we installed AdvanTech on floor system we received several rains and one snow. There was not one place in floor that buckled or swelled. It made a nice level floor that with all the bad weather looks real good. The fastening grid works great. Did not have to strike one line." "AdvanTech subflooring is the best flooring I have ever used. I have seen it in the rain, sleet and snow and it still doesn't swell up. I recommend it to every customer I build a house for." "We were the private contractor for our own home. We were very satisfied with fastening grid flooring. After we installed the floors with the roof not yet fully installed and it would rain, the water would bead up on the boards. There was no damage done." "A builders biggest problem is snow and rain damages during construction. AdvanTech has solved this problem for us. Also, AdvanTech is a great sales boost since most homes are sold during construction. Our customers recognize quality. We use AdvanTech on 100% of our homes. " Whitman Homes in Canton, MA discuss the many advantages of building with AdvanTech flooring. Infinity Homes in North Carolina explain why they made the switch from OSB to AdvanTech Flooring. 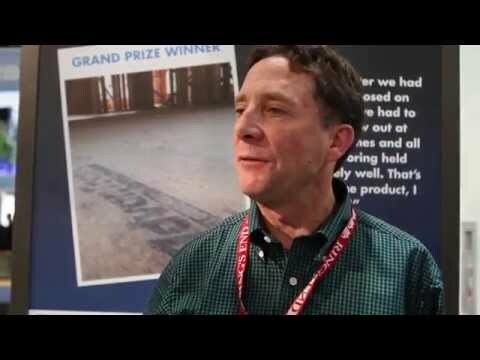 Roland Thomas of Glenfield Builders in North Carolina explains why they chose AdvanTech flooring..
Builders in Washington State describe how AdvanTech Flooring has been the perfect solution to jobsite delays and rework caused by moisture. Thompson Custom Homes in Houston, TX describes how AdvanTech has helped them eliminate the moisture problems encountered with other OSB and plywood panels. A large snowstorm convinced them to switch to AdvanTech Flooring thanks to its moisture resistant qualities.